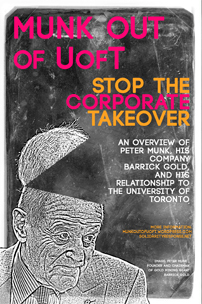 “Peter Munk OUT of UofT” is an initiative of concerned students and professors at the University of Toronto, as well as members of the general public. E-mail MunkOUTofUofT@gmail.com if you want to know more or get involved! All of this information on this site is copyright free! Please spread this information far and wide! I have a status-only appointment with the University of Toronto. I am very concerned with the degree of input Peter Munk has in the curriculum. How can the University reconcile its commitment to knowledge and the subversion of it? As a member of the allied health community, I am also deeply concerned with U of T benefitting at the expense and health of the poorest citizens of our global community. These are troubling issues for a University that has just begun to realize how dangerous this partnership is.